I don't settle for mediocrity. I hate to live my life as an average. That's the reason why I constantly seek for personal success whether through new goals achieved, new habits gained, new books finished, new tasks done etc. I love developing myself personally and professionally by investing in myself. 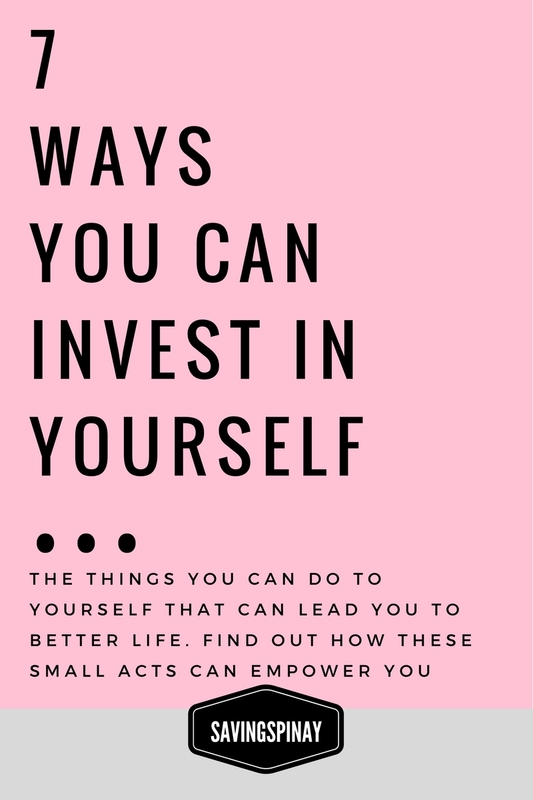 So I thought it would be nice to share the 7 Ways You Can Invest in Yourself Too. Its time to think about you and how you can make a better life. We are all about giving to others that we forget to give to ourselves and this post is a complete opposite. We will be a little selfish and empower each other. Investing in yourself is important because its your own way of living life better. The return of your investment is passive, meaning it grows exponentially without you even lifting a finger. If investing your money comes with inevitable risk-factor, investing in yourself is complete opposite. Its risk-free and full of rewards instead. Having a happy morning will lead you to a happy evening and vice versa. Its important to have a perfect morning routine and perfect evening routine that will lead you to success. The way you shape your day will make a big difference on your future. It would either make or break you. Personally, having a morning and evening routine lead me to a clearer day. I feel more inspired to work and plan for the future. I see investing in a morning and evening routine to be the first on the list and the easiest to accomplish. Establishing a good skincare routine is non-negotiable. When you look good outside you feel better inside. See my own day and night skincare routine as reference. I stumble upon the idea of Miracle Morning on BohoBerry, one of the page I visit for bullet journaling inspirations. Anyway, the goal is to be as productive as possible before your actual day begins. Miracle Morning suggests the acronym S.A.V.E.R.S. S is for Silence like meditation, prayer, breathing exercise or any activity that will calm your soul and mind. A is for Affirmation or encouraging words that will help you see the day better. V is for Visualization where you'll set a nice vision of the day and really set your heart and mind for a productive day. E is for Exercise or any physical activity you can include to get the blood and oxygen flowing to the brain. R is for Reading where your positive thoughts and ideas are available to improve yourself. S is for Scribing more known as writing which is a good way to process your thoughts first thing in the morning. This will enable you to really focus on either pampering or dozing off. The most difficult part of growing up is knowing what you really want in life. Your choices shift a lot, your views and opinions change in an instant and you get easily caught in everything that's going on. My best advice is to figure out what you love, continue planning what you want for your life and lay down all the next actions. If you haven't tried doing some major goal setting in your life then what are you waiting for? Learn how to set some personal and financial goals that can put you on a rather productive phase. Doing some SWOT analysis on your life will help you build a better you. Ask yourself what are you good at and focus your time and energy building your life around those strengths. Instead of wasting you precious time on social media why not start reading books and blogs instead. Go visit a bookstore today and scan through books for new lessons. You can always search online for free seminars, events and workshops you can attend personally love joining these affairs because it opens new opportunity to learn. Don't feel bad getting a check up as long as you feel much difficulty and something is bothering you. Try to invest in a health card if and then your company doesn't provide. Eat and drink healthier than before. My mom does this detox water with lemon and cucumber and its super nice to have morning and night. You cannot let your money issues rule your life forever. Getting your finances in order is one way, saving money is another. Have all the means to be financially stress-free. We need to stop neglecting our financial obligations from building a emergency fund to getting out of debt. You need to learn how to handle your finances wisely. This includes your emergency fund, investment fund, retirement fund etc. Avoid incurring more debt by learning to live within your means. Always aim for a positive finances no matter what. The best time to invest in your future is today. The lesser financial responsibilities you have the more you can contribute to your retirement fund. It takes a lot of maturity and courage to let go on the people that caused you too much pain. Know that you deserve only the best in life so don't waste your time minding people who don't add to your wholeness. Know that they are the only people who will be there for you when you need them. Make an effort to remember special dates and birthdays in your family and close friends. You don't need to give gifts just small gestures and let them know you appreciate their presence in your life. No matter what you do or what you say you can't force someone to appreciate you on your own liking. You need to earn their respect. I've been a push-and-pull situations towards my spiritual life but I thank God for not letting go of me. He always remind me of the value of faith and of living an intentional life. I believe its important to take a good look on the activities we do for the glory of God. We need to invest our time and efforts to nurture our faith. The primary goal of knowing Jesus and building a God-centered life should be the number one priority. Stop holding grudges on your current status but try to be grateful on the small things that make your day better. The Bible holds all the answers to our life's important questions. The Bible is also important to read for knowing God and His will for our lives. To end this post I want to give you some small actions you can do that can lead you to better life. Choose something you can start today and find out how these small acts can empower you. What baby steps can I take to improve? How can I build upon my successes? c. Choose one physical task you can do today and something you've been neglecting for a long time. d. Plan your day in advance. Learn to do a to do list and ace each on your list. e. Sleep and Wake Up Earlier. Proper sleep can give you a ton of benefits. It allows you to be more productive and enjoy your sleep. f. Develop Habits and Routines. Daily routines give a structure on how you live your life. Its nice if you incorporate as many new habits and routines on a regular basis. g. Travel. Save money and make time to travel. Learn new culture, cultivate on new surrounding and immerse yourself with the nature. You will find yourself having new perspectives on life. What investment are you most eager to do for yourself today?